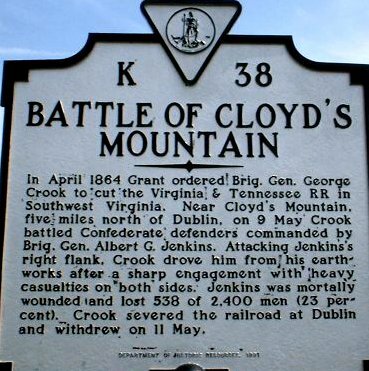 The Battle of Cloyd's Mountain was a Union victory in western Virginia in 1864 that allowed the Union forces to destroy the last railroad that connected Tennessee to Virginia. While two future U.S. presidents fought in the battle, Rutherford B. Hayes and William McKinley, Hayes would serve as 19th President, succeeding U.S. Grant in office, and McKinley, having survived the bloodiest war in U.S. history, would serve as 25th President only to fall victim to an assassin's bullet, which would result in his Vice President, Theodore Roosevelt, assuming the presidency. 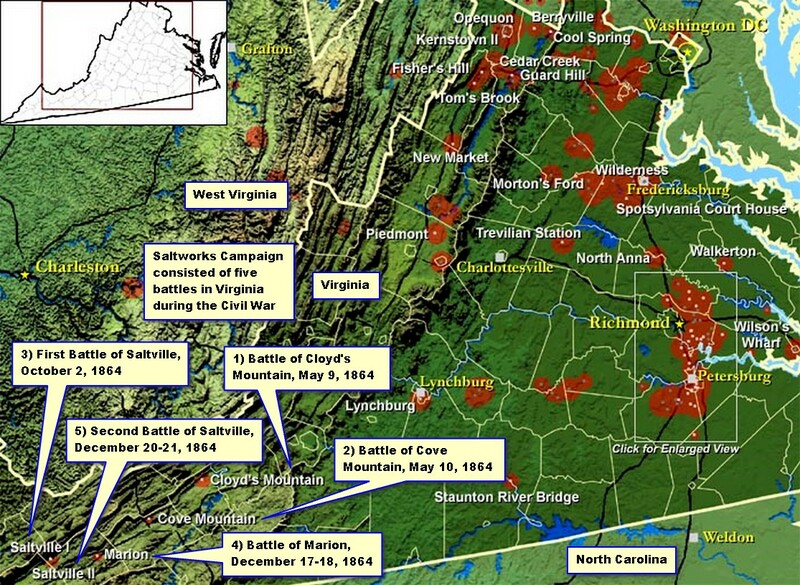 The Battle of Cloyd's Mountain was contested on May 9, 1864, at Pulaski County, Virginia. Union Brig. Gen. George Crook, commanding Kanawha Division would press the seven fight against Confederate Brig. Gen. Albert G. Jenkins, commanding Department of Western Virginia. Union troop estimates were 6,100, and Confederate forces were numbered at 2,400. Union casualties were 688, while Confederates losses were 538. Brig. Gen. Albert Jenkins decided to make a stand at Cloyd's Mountain, and set up a strong defensive position. When Brig. Gen. George Crook arrived he decided against a frontal assault, concluding that the Confederate works were too strong and such an attack would decimate his army. The surrounding area was heavily forested so Crook used this as cover and swung his brigades around to the Confederate right flank. Crook began the battle with an artillery barrage and then advanced his brigade of green West Virginians under Colonel Carr B. White. Crook's remaining two brigades under Horatio G. Sickel and future President Rutherford B. Hayes were to launch a frontal assault as soon as the West Virginians had gotten under way. Carr's brigade, in its first fight ever, advanced to within 20 yards before heavy casualties; its exposed position forced its withdraw. Crook, moving with Hayes' Ohio brigade, had to dismount and traverse the slopes on foot because they were too steep. Still wearing his jack boots, he sank in a small stream, that his troops were crossing, and his boots filled with water. Nearby soldiers rushed back to their general and pulled him out. Hayes' brigade spearheaded the main assault at approximately 11 a.m. The troops fought their way to the Confederate works and severe hand-to-hand fighting ensued. Sparks from the musket fire ignited the thick blanket of leaves on the ground and many men from Sickel's and Hayes' brigades were pinned down and burned alive. The two brigades began to fall back when Crook sent in two fresh regiments into Hayes' front. The West Virginians finally advanced against the cannon that had plagued them throughout the battle and overran its crew. Now, the Ohio troops began to overwhelm the Confederate center. Jenkins tried desperately to shift troops to the threatened areas, but fell mortally wounded and was captured by Union soldiers. His second-in-command, John McCausland, took command and conducted a rear-guard action as he withdrew his troops. The Battle of Cloyd's Mountain was short and involved few troops, but contained some of the most severe and savage fighting of the war. The entire engagement lasted a little over an hour with much of it being hand-to-hand combat. Casualties were high for the modest number of troops involved. Crook lost 688 men, roughly 11% of his force. The Confederates lost fewer men—538—but that totaled 23% of their total force. The battle is considered a Union victory because Crook was able to advance and destroy the Virginia and Tennessee Railroad at Dublin, Virginia, and Averell was also able to destroy several railroad bridges along the same line, severing one of the Confederacy's last vital lifelines and its only rail connection to East Tennessee. See also Battle of Cloyd's Mountain: A History. Sources: Kennedy, Frances H., editor, The Civil War Battlefield Guide: Second Edition (1998); Official Records of the Union and Confederate Armies; National Park Service.